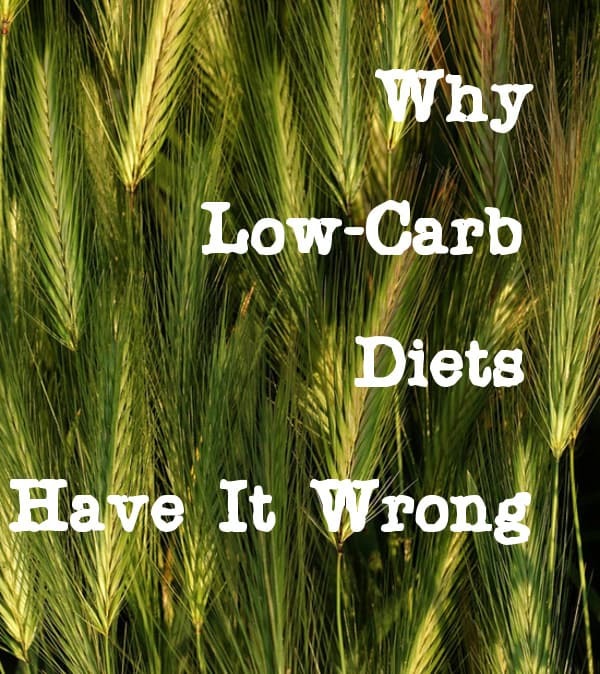 Have you noticed that in the past few years low-carbohydrate diets have become very popular? We can open just about any popular health-related magazine and see recipes and articles targeted to the followers of low-carb lifestyle. We often hear about this or that celebrity dropping lots of weight on a strict Atkins diet. TV shows invite ‘experts’ that give you advice on how to cut more carbohydrates out of your diet: I recently saw a bit on Today show where their guest suggested replacing pizza crust with a grilled chicken breast (!) – yep, just pile all of your pizza toppings and cheese on a piece of meat on your way to those skinny jeans! And yet, the obesity levels in the US alone are at their all-time high, and we are even more sick than we’ve ever been. What’s going on? When it comes to health and wellbeing, our priorities have undergone a dramatic shift. In fact, we are way more concerned with ‘losing weight’ these days than ‘being healthy’. In our society addicted to instant gratification, looking good on the outside is valued higher than feeling good on the inside. As for the long-term effect, or simply making sure that we’ll still be alive and kicking some 30-40-50 years from now – we just don’t care to look that far ahead. We want to see results right then and there – and if it means sabotaging our health along the way, let it be! Wait – there’s something wrong with this picture! I’m not going to argue: if you dramatically reduce the amount of carbohydrates you consume, you are going to lose some weight. When the body is not receiving enough carbohydrates (its primary source of energy) on a carb-restricted diet, it turns to burning fat for fuel. This only happens if the body is undergoing a dramatic stress that’s putting it in the starvation mode. The acidic byproducts of this metabolic process are called ketones (acetacetic acid, B-hydroxybuteric acid, and acetone), and the process itself is called ketosis. Trouble is, it’s hard for our bodies to stay healthy under a lot of stress. Ketosis can cause much more long-term harm to our health than the short-term effect of low-carb weight-loss is worth. Not only is it associated with loss of appetite, nausea, mental fog and fatigue, it can also cause irreparable harm to our kidneys and other vital organs. Following low-carb diets for a long time can throw our metabolism out of balance. Low-carb diets advocate for high consumption of animal foods with low amounts of fiber- and carbohydrate-rich plants. Since meat and dairy have no fiber in them, people following those diets often suffer from constipation. Plus, who wants their breath to smell like acetone? Read more on the subject in this informative article by Dr. John McDougall. But the biggest argument against low-carbohydrate diets is the fact that it is nearly impossible for humans to maintain this dietary pattern for a long time. Eventually, low-carb followers go back to consuming carbohydrates, and since their metabolism was compromised for so long, they tend to gain back all of the weight they’ve lost and then some. Even Dr. Robert Atkins, the founder of the famous Atkins diet, admitted that he was at least 20 pounds overweight after being on and off of his namesake diet. Dr. John McDougall, the long-time proponent of the starch-based diet, has seen positive results in his patients both in weight-loss and regaining health. I highly recommend reading this article, in which he dissipates a number of myths about low-carb diets. For the record, I am not in any way compensated by Dr. McDougall for writing this. To prove this point, I don’t have to go very far. It’s no secret that lots of trim, healthy people in Asia have been thriving on carbohydrate-rich, rice-based diets for thousands of years. Whole grains and unprocessed starches have fueled generations of great nations all over the world (more details in this post). Those people never count their calories, enjoy lots of home-cooked meals prepared by recipes passed for generations, and maintain active lifestyles well into their old age. So does it make any sense to restrict ourselves in the consumption of a macronutrient that was vital for human survival since the dawn of the mankind? I don’t think so. As I’ve mentioned above, it’s hard to debate that the information on low-carb diets is very easy to come across these days. So if ditching carbohydrates long-term can be harmful for our health, why don’t we ever hear about the other, high-carbohydrate approach? Surprise surprise: There’s much more money to be made off of diets rich in meat and dairy than the ones promoting rice and broccoli. Newspapers and popular health-related magazines strongly depend on their advertisers from dairy and meat industries, so they continue to churn out the content that makes the big guys happy. Add to this the profits of drug industry from selling us medicine to treat the symptoms of diseases caused by excessive meat and dairy consumption, and you get the picture. Have you noticed that the word ‘carbohydrate’ itself has gained a negative connotation in the past years? The negativity spreads both on highly-refined foods like store-bought cookies and chips, and whole foods like potatoes and rice. Average people don’t know the difference between ‘processed’ and ‘whole’ foods, so they become easy targets for low-carb promoters. It’s usually easy to see if an article/TV special promoting low-carb diets can be traced back to the meat and dairy industries: just do a quick Google search of the author’s bio/credentials, and you just might discover the link. Sometimes it’s even easier: the article might state loud and clear that it’s ‘Sponsored by National Cattlemen’s Beef Association’ or a similar organization. To sum up my point here, I strongly suggest that we do our own research before we jump into a new, trendy diet craze that’s heavily promoted by multiple media outlets. When out health is at stake, we ought to exercise caution, or else we risk to fall for yet another fad. In fact, do your own research of the points I’ve covered in this article for a good measure! Also, check out other articles in the ‘Why Go Veg?’ section of my blog for more info on whole food, plant-based diet and health. Want to read more articles like this one? Stay connected to Vegan Runner Eats by subscribing through email (top right of this page, no spam ever! ), Facebook, Twitter, and Instagram! Tagged carbohydrates, John McDougall, low-carb diets, starch-based diet, whole food plant based diet, whole grains. Bookmark the permalink. Interesting Read. Although I think you are neglecting a major undeniable statistic about carbohydrates. If you look at the increased sugar intake of any society over time, you will see a perfect linear increase in rates of obesity and type 2 diabetes. This is seen over and over again. In every large scale study. You are clearly a fit and healthy, very active person. I presume given your lifestyle you would have a fast metabolism and a good response to insulin. IE you are NOT in anyway insulin resistant. This is great, and veganism certainly is no bad thing, if thats how you are promoting yourself, then good on you. As you point out, the trend in the plant based community is to suggest any low carb diet stems from consumerist meat and dairy industry propaganda. Many prominent vegan (drs) i use this word carefully, use this statement too flippantly. There are also many “non profit” scientists and drs who think otherwise. Do you agree if you are over weight and inactive, it isnt a bad idea to reduce your total carbohydrates? Veganism has nothing to do with this argument. So im not in anyway belittling someones choice in diet. Do what works for you. A vegan can easily go “low carb” too after all. Its also interesting to note their is no correlation between the fat we eat and the fat we store, cholesterol levels it seems are not fully determined by fat intake, (trans fats are trash for sure though) . You do point out, that good carbohydrates are less refined. I totally agree. However i have noticed at vegan festivals, and stalls, a lot of the food revolves around refined sugar and white flour as a key ingredient. it is often used as gift, or incitement to non vegans, ie “have a cupcake and a chat with us”. Is this to sweeten the blow, excuse the pun. Ive heard all the arguments for and against “carbs” from both sides of the camp. I think there is a place for them in the human diet and has been since the beginning. But over eating them will not solve the worlds obesity crisis. Keep on running and please remember not all carb reduction ideas are paid up by the meat industry. If you truly believe this, then It is highly likely that a a big vegan youtube Dr, might be helped by the sugar industry! Thank you for your comment, Fernando. I agree that there’s a lot of confusion among the big thinkers re: best dietary approach for humans, and in the years since I wrote this post I’ve stopped telling people what they should do with their diets (I’m not a doctor after all). Instead I try to show what works for me personally, letting others make their own decisions. One thing though: the notions of ‘whole food plant-based’ and ‘vegan’ are often used interchangeably, but they aren’t exact synonyms. So the white flour and sugar cupcake at vegan festivals would fit the notion of ‘vegan’ but not necessarily WFPB. Going vegan isn’t a guaranteed pathway to better health, but going WFPB just might be (again, depends on the individual person and their health history, etc. ).